Permeable pavers (like flag stone or traditional concrete) allow water to flow off the surface into surrounding gaps, which are filled with fine, crushed aggregate that permits water to flow into the soil below. 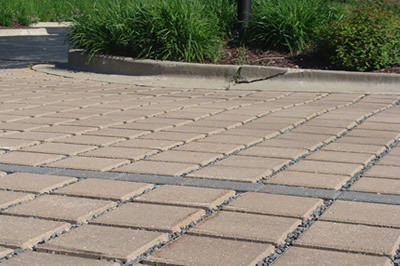 The infiltration rate of permeable pavers depends on the gap size and aggregate used. Pervious hardscapes allow water to pass through the surface material and sink back into the soil. The water seeps through to a rock base layer and is naturally filtered through the underlying soil where pollutants can be further filtered. Pervious materials increase infiltration of surface watering landscapes and areas adjacent to buildings and structures. Popular choices include pervious paver stones, turf block and permeable asphalts and pavements, gravel, decomposed granite, or wood chips for walkways. The infiltration rate in a pervious hardscape can be 10 times greater than porous concrete, and more than 90 times greater than permeable pavers. Any hardscaped areas (such as driveways, paths, patios, and residential parking areas) located a minimum of 2 to 5 feet above the seasonal high groundwater table and at least 100 feet away from drinking water wells are candidates for replacement with pervious hardscape.